Helloo from the Berkshires, friends! I’ve been here for over three weeks doing loads of camp counselor-y stuff (I’m now responsible for 9 other humans? Whaat?) and staying up late eating way too many slightly stale snacks. I’m loving my time here–the girls I’m on staff with have been some of my best friends for years and years, and I’m so happy to have the chance to spend the summer working alongside them. It’s both weird and wonderful to be stepping into a role I’ve looked up to for 8 summers; the adjustment was–scratch that, still is–a big one, and my first two weeks here were far from easy as I was hit with homesickness and general nervousness about being here for a full 9 weeks. But as time has passed and I’ve settled in, I’ve only grown more and more appreciative of this place and the things I get to do here as my job. While this place is certainly my second home, I do still miss some of the comforts of my house and my family. I miss hugging my mom and dad and brother, I miss sinking into my own bed, and I miss baking–not complex macarons or cakes that take me three days to finish, but the homey things my mom taught me to make: muffins that come together in ten minutes, chocolate chip cookies, fresh berries wrapped in a bit of leftover pastry I dig out of my freezer. 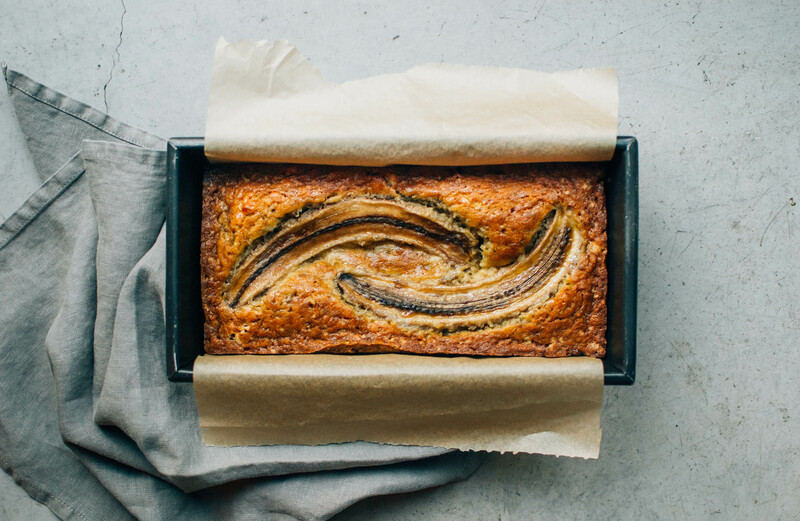 Banana bread falls into that same category of Simple Things I’ll Never Stop Loving, things that are just as easy and classic as they are good. 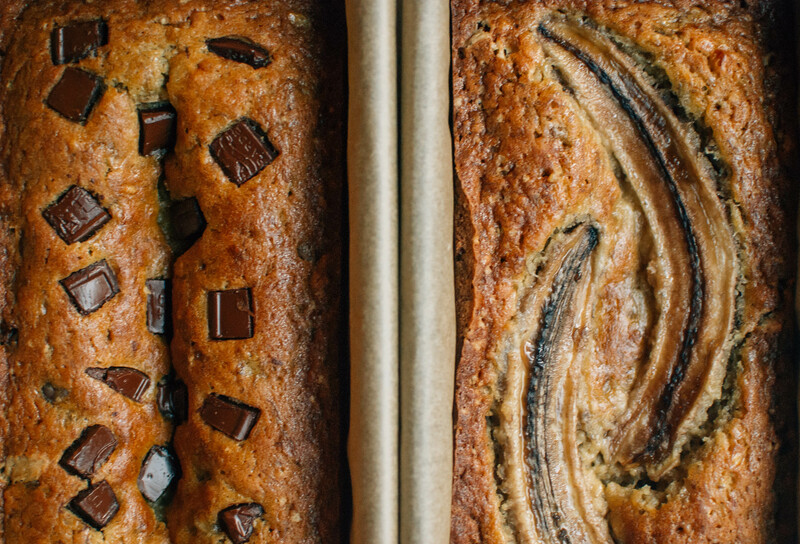 My memory of banana bread stretches way back. When I was little, I’d often wake to that entirely unmistakeable smell of banana chocolate chip muffins in the oven; they’ve been my mom’s go-to since before I can remember. The recipe that she uses and that I’ve adapted here is from a book called Loving Food, a book that’s been on our cookbook shelf for what feels like forever. The original is perfect in its own right, but I made the decision a couple years back to try replacing the butter with coconut oil, subbing in some whole wheat flour, and adding some brown sugar in place of some of the granulated. 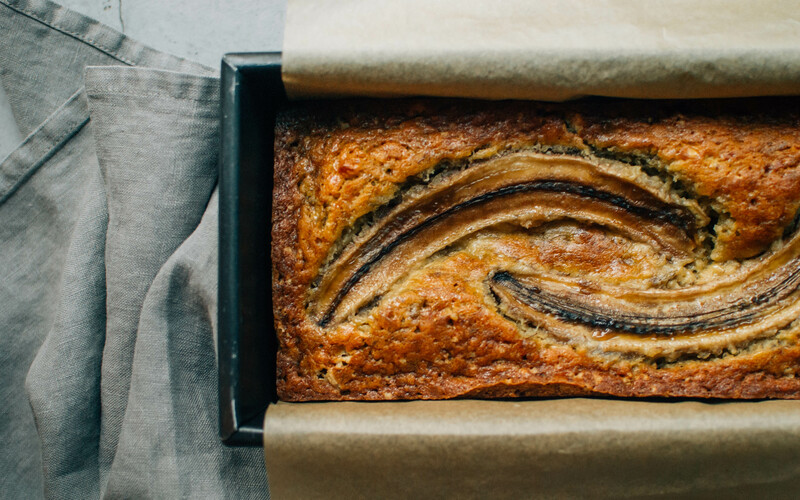 And with those tweaks, this recipe became my all-time favorite for banana bread–and, if I’m being honest, it might have become my favorite recipe, period. Preheat the oven to 350 F. Grease a loaf pan and line with parchment. In a large bowl, cream the coconut oil with the sugars until fluffy. Beat in the eggs. In a small bowl, stir together the baking soda and sour cream. Add this to the oil mixture and mix until combined. Stir in bananas, flour, salt and vanilla, then mix in the chocolate if using. Pour into the prepared pan and top with the banana slices if using. Bake for 45-60 minutes, or until a tester comes out clean. Cool on a wire rack. I love this recipe. Simply perfect. YUM!! I love this recipe. The sliced bananas on top are so creative. I love that idea. Although I might have to use chocolate chips AND the banana slices because I have a hard time deciding not to use chocolate if its ever an option!